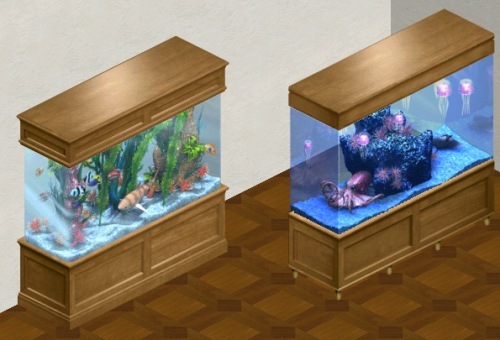 The octopus tank requires Superstar, the other one Hot Date. The Hot Date fish tank was made smaller. The original bleeds horribly through the floor of the upper story, that is almost gone in my version. Das Oktopus Aquarium braucht Megastar, das andere Hot Date. Das Hot Date Aquarium wurde niedriger gemacht. Das Original blutet fürchterlich durch den Boden des oberen Stockwerks, das ist bei meiner Version fast ganz weg.